Ever notice how easy it is to get behind on your prep? It may take only a few missteps, but there's another side to the story. Staying on track is also just a matter of a few best practices and can be just as easy! An effective MCAT study plan guides you in what to study and when to study to make sure you cover the necessary content and skills in time for test day. If your study plan is simply a time-schedule and doesn't include what you'll be studying on each day, you may be behind schedule and not even know it! This is even more true if you don't have a plan at all. By planning from start to finish, you'll be able to detect early in your prep whether you can meet these criteria and make appropriate adjustments, perhaps even before you've scheduled your test date. This tactic is two key principles wrapped up in one! First, do a little instead of nothing. Balancing your MCAT prep with everything else in your life will require a lot of little choices. It may seem at times your too busy, too tired, not prepared, or not motivated to do your prep. But substitute blowing it off completely for doing just a little. Can't watch that whole lecture? Review the last lecture's notes then watch the first 10 minutes. Can't go on? Do just 10 more minutes! Build the habit of doing something, and you may find, on most occasions, you'll pull off what you thought was impossible! The second principle is to make up a little at a time to catch up. The same way you fall behind schedule is the same way to pick it backup: a little at a time! Don't allow the concern of needing to get back on track as fast as possible block you from making progress or, worse, begin a snowball effect that pushes you farther and farther behind. For example, let's say you study Bio Monday-Tuesday-Wednesday and Psych Thurday-Friday. If you miss your Tuesday Bio session, don't push everything back, but move Tuesday's lesson to Wednesday and split Wednesday's lesson over Thrusday and Friday. That way, by Saturday you're back on schedule with just a little effort and not stressing about being behind schedule. 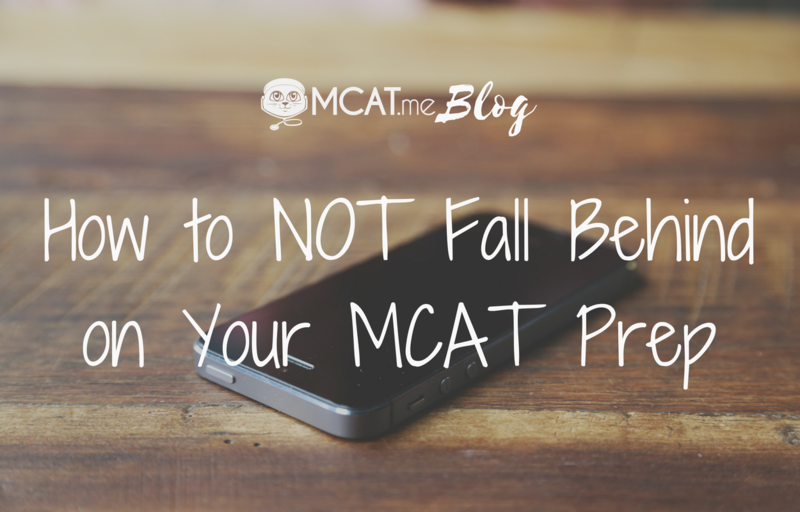 Practicing focus may bring attention to an addiction to distraction, and as such it will take time and perseverance to break those little habits, but stick with it for a big advantage in your MCAT prep.